Over a year ago, Kinorigo embarked on an exciting adventure. We took a journey right from the natural uncut block of granite all the way through to the finished paving slabs in the photo above. The project for Merchant Square, London located right by Paddington station was started back in June 2013. The brief stated the stone they needed to purchase would have to match exactly some which was already there. Working side by side with Townshend Landscape Architects we got to work solving this brief. Merchant Square is a newly planned development in London aiming to become the capitals most exciting new place to live and work. This prime location is 10 minutes’ walk from Oxford Street, a 10 minute Taxi ride away from the Eurostar and a 15 minute rail ride to Heathrow. Those spontaneous weekend trips to Paris have now been made easy with this high end living. 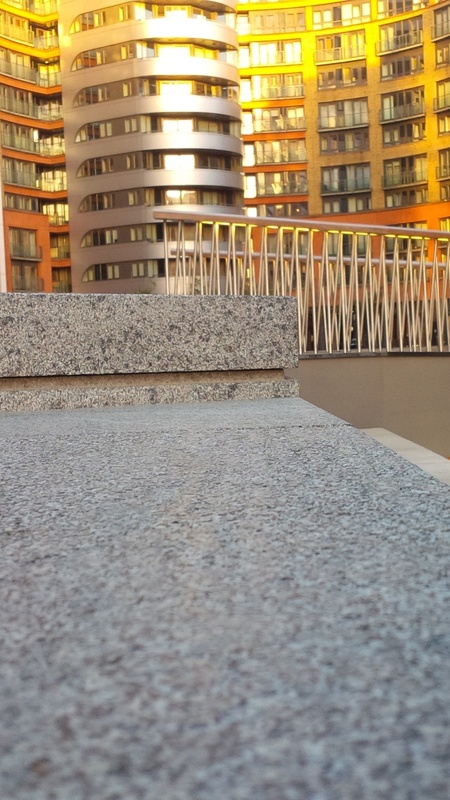 To produce a classy and tasteful water feature Kinorigo provided granite slabs for the area known as the ‘Garden square’. The Garden Square is situated centrally between the buildings of Merchant Square, with the finishing result as a pleasing puzzle of circular slabs benches and canal edgings along with a stunning water feature built in three rings. The Client – European Land wanted the new stone to match the granite that had been installed about 3-5 years previously, so we set about trying to locate it exactly from a selection of Spanish Quarries. This was achieved with our professional working relationships with these brilliant Spainish granite quarries. . Townshend Landscape Architects then sent over the drawings for an exciting circular design including slightly angled benches around the edge, which followed the design. From these drawings we created a cutting list and sent it to the quarry to go ahead with cutting directly from each slab. 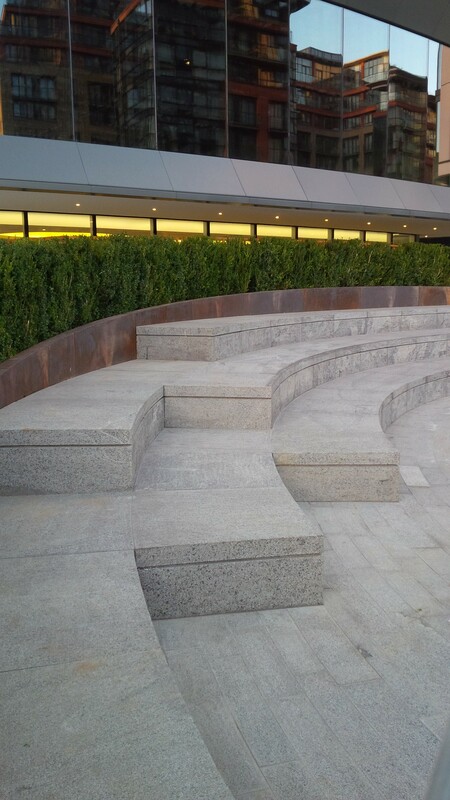 The hard wearing capabilities of the granite were a decider for the client as well as it's mottled grey colour variations, also an attraction as this was more exciting and added a lot more value than just a plain grey. The job went well over all, we made sure to include visits to the quarry many times to manage the quality and keep inspections going throughout. The main positive from these visits was that it kept the damage and mistakes next to nothing, a constant challenge with a large bespoke order. The result being less blunders than the usual 5% to be expected with natural stone and bespoke sizing! The quality was sorted so well throughout the whole process. Some containers of pallets were delivered before schedule, these then had to be put into storage and extra management of the deliveries to site was required. Some of the stone was flamed and the rest bushhammered, two of the items came with the flaming short so Kinorigo then organised the flaming to be finished off on site very promptly. Take a look at images of the slabs being cut in the quarry and some of the finished images of Merchant Square. What a stunning result, well done team. 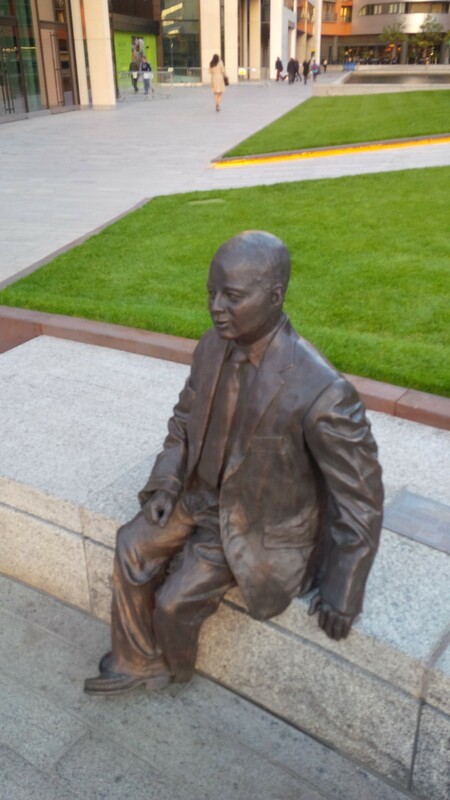 Interesting Fact: The Bronze Status of the man sitting on Merchant Square is Sir Simon Milton a former Deputy Mayor of London who had the determination to create a new West End quarter at Paddington.